To many, classic cars are for when the sun is shining, the road ahead is clear and your favourite person is next to you. In other words a sunny Sunday is the time to get behind the wheel. Thankfully not everyone sees it like that and there are many enthusiasts who use their cars as everyday classics. After all when our cars were new they weren’t built for sunny Sundays, but everyday of the week. Of course you can use any classic everyday, but have you noticed the number of Ford Mustangs out on the road on an everyday basis? We at Classic Car Gurus certainly have and all we can say is more power to the owners of these wonderful American classics. A classic that when new redefined how the American motoring public looked at their cars. 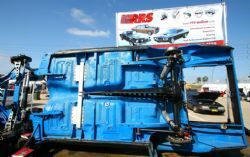 Matthew and Angela Pankau are the proprietors of RRS Pty Ltd and are both firm believers in using the iconic Mustang on every occasion possible – weekends or seven days a week. However while they applaud the enjoyment of Mustang ownership they are also well aware that under the metal skin there is still sixties’ technology. So they set about to do something about it and the results are nothing short of spectacular. While Matthew is CEO and designer of RRS Pty Ltd, Angela has Sales and Marketing well under control. Matthew Pankau has over 30 years in the automotive industry, especially with early Fords and race car setup. Prior to RRS Pty Ltd (Revelation Racing Services) Matthew ran his own automotive restoration business and he could see the increasing interest in early Fords. Australian interest in the Mustang was growing dramatically and it was clear that the love affair for the Coke bottle style was just as big today as it was forty years beforehand. However he could also see that while early Ford suspension design and brakes were state of the art during the 1960s they could just not keep up with modern practices. So Matthew set about to design new suspension and brake components for early Fords and what followed could be called an Australian success story. First of all Matthew designed a complete front strut and disc brake kit for the 64 ½ to 73 Mustang to suit modern radial tyres. Then instead of going off-shore for manufacturing had it all done in Australia. Of course if you know your classic Fords, you will also know that if it fits a Mustang it also fits the 1960 XK to 1987 XF Falcon, as well as the Australian built Fairlane of the same period. By the way if you’re thinking that you need a blow torch, welder and big hammer to make it all fit, think again as with all RRS components it bolts straight in to existing fastening points. Now if you have driven an early Mustang or Falcon you would know all about the 22 turn lock-to-lock, less than precise steering. So Matthew’s next design was a purpose built rack and pinion steering that again bolts straight in to existing holes. Great for RHD conversions. With the front tied down Matthew then turned his creative mind to the rear. Having discs up front are a great improvement, but then he designed a rear disc set up that fits so neatly that you can still use the original handbrake cable. Honestly, can you get any easier than that? Still down the rear, Matthew looked despairingly at the original solid axle and semi-elliptic springs. Great for the swinging sixties, but if you’re looking for the sophisticated ride of the new millennium it all left a little to be desired. So what about a new coil-over-shock 3-link rear end that does away with the leaf springs altogether? Yes all available and not only for your early Mustang, but also for Falcon, Fairlane and Cougar. Okay you have looked after the underneath of your early Ford and you’re still in love with the classic body styling. Honestly you know the body may have a little rust here and there, heaven knows how much you spent on the last batch of stress fractures you had repaired and the 289 may be blowing a little smoke. 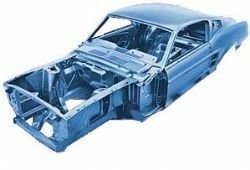 What about if we were to tell you that you can buy from RRS Pty Ltd a brand spanking new 1967/68 Mustang body shell? Well you can, and to make it even more attractive it’s made by Dynacorn and stamped and licensed by Ford. “But wait there’s more!” as they say in the classics. It’s not only designed for right hand drive, but also engineered for the modern quad-cam 5.4 litre V8 and all RRS components. Just imaging that. The classic sixties Mustang styling, modern engine and everything underneath that will make it behave the way you want it. Of course all RRS Pty Ltd components have passed the stringent Australian Road Authority standards. RRS Pty Ltd has a great website at www.rrs-online.com or give Angela a call about how they can help your classic Ford or what you could be soon be driving.